Choosing the best interior paint colors is one of the greatest remodeling challenges homeowners face. On a whim, you may choose a bold color scheme, which isn’t likely to remain your favorite. In fact, neutral colors don’t go out of style and most people don’t grow tired of them. Neutral bathroom paint colors create a welcoming vibe and allow textural elements such as linens, tiles, and wooden accents to stand out. Shades of white, gray, beige, and cream are always relevant. They may not seem vibrant at first. However, these colors contribute to a more unique interior and décor. You can show off a variety of furnishings and textures and make your bathroom an inviting and vibrant room. A neutral paint is the gateway to an optimal bathroom design. You can add a modern tub and textured tiles later. Wood vanities and other accents add to the appeal. But think about what would happen if you painted the walls too bold a color. 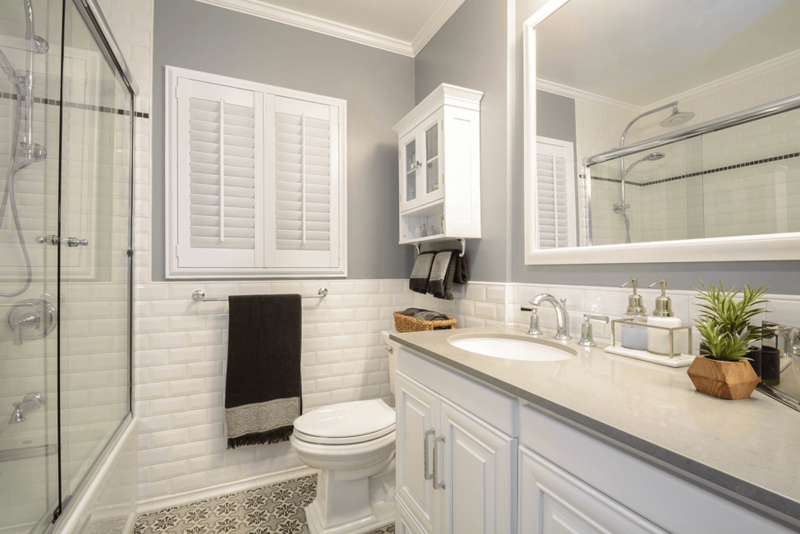 You’d get tired of it and have to remodel the room all over again, and bathroom remodeling isn’t something you want to do often. After all, the bathroom is a place you want to feel calm. A bold red or orange is not going to have the desired effect. Neutral surroundings such as smooth gray and white walls, enable you to customize the room to any taste. A neutral color scheme helps the room seem larger, cleaner, and airier. You can always enhance the style with just a few minor accents. Neutral colors go with just about anything; you can add a cool new towel rack, ornament, or floral arrangement to boost the atmosphere and mood. Light Beige and other beige-like colors from Dunn-Edwards go with anything from glass tiles to natural stone. Choose from Antique Paper, Fossil, Moonlight, Dove’s Wing, and other shades, or the cooler Shadow White. A relaxing, inviting feel is just the beginning. Think about all the design elements you can easily add, and even modify or replace without much effort, once you have the ideal neutral color. Used alone or in combination, these can add personality and allow you to do just about anything. Subtle differences in shade matter. You can go gray-on-gray to smooth out the design and give the room a classic yet modern look. It enables you to use a diverse range of furnishings as well. Do you enjoy wood or stone or something more ultra-modern such as steel? With neutral walls, you can pick and choose without remodeling and repainting all over again. 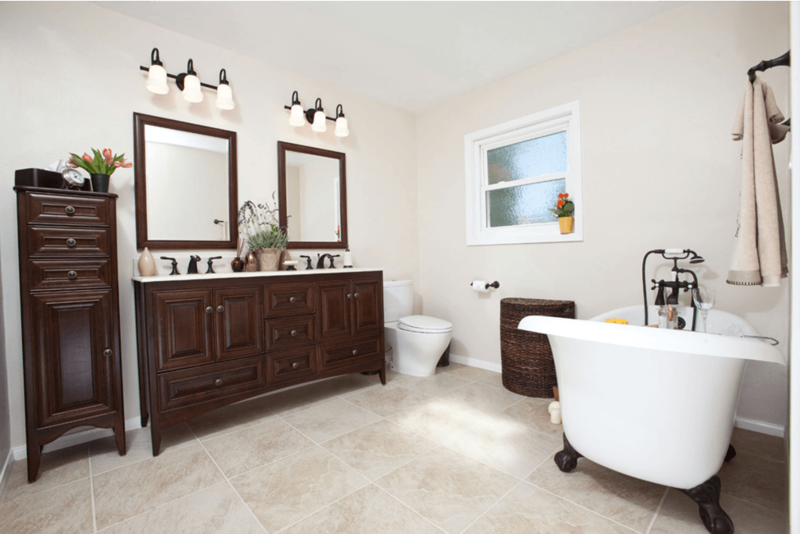 If you are interested in remodeling, have the experienced bathroom remodeling professionals at One Week Bath help you design and build the perfect bathroom and choose the best interior paint colors. For details on our custom design bathroom services and process, submit your project details online to request a design consultation and quote, or call 888-374-0622 today!